← The Edamame is ready. So are the tomatoes. We had our first frost on Tuesday night. The more sensitive, warm weather plant are finished for the year. The weather wasn’t cold enough to damage the fruit on the plants, so now it’s time to harvest whats left in the garden. Basil is probably the most sensitive plant. It will turn black when the air temperature gets into the mid-thirties. Basil is very sensitive to the air temperature and will discolor when it gets too cold. Zucchini is also sensitive. These plant show the tell-tale signs of frost. None of the zucchini seem to have been damaged by the frost. 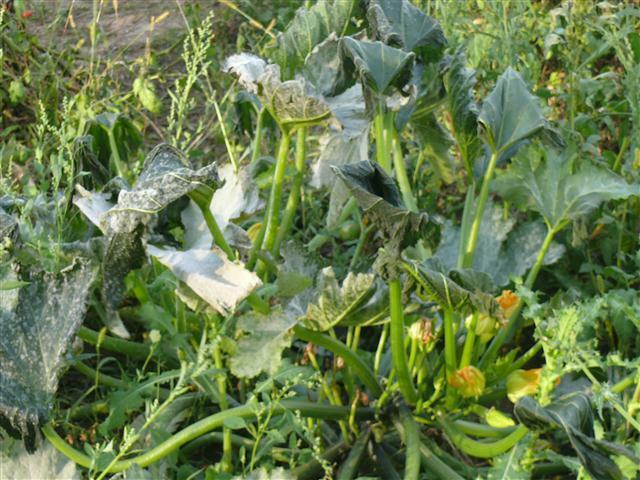 The zucchini plants were exposed to low temperatures, causing the leaves to wilt. 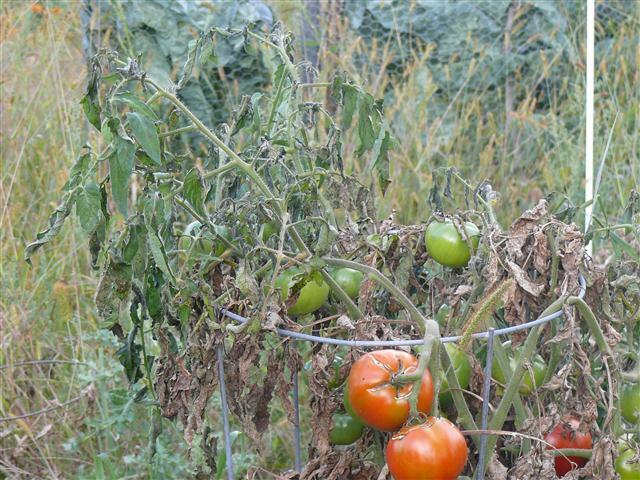 The tomato vines started to die back about two weeks ago, signaling that the tomatoes are at the end of their season. The leaves that were still green were wilted by the frost. 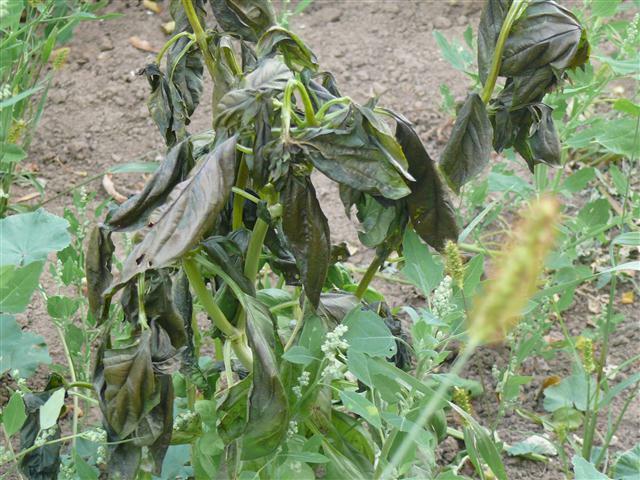 This photo shows what happens to a tomato plant when it gets too cold. The fruit is still good, as it hasn’t been frozen. We will still have tomatoes for a couple of weeks however. If undamaged, the fruit will continue to ripen. Tomatoes are also easy to ripen off the vine. They can be placed in a paper bag or covered box and taken indoors, where they will ripen in a few weeks. Be careful not to include any damaged tomatoes as they will quickly rot. The first frost marks the transition into the fall vegetable season. From now on we will be focusing on the hardy cold weather vegetables like Brussels Sprouts and the root vegetables. The pumpkins are doing great and pumpkin picking has started! Poor basil, it looks sad. No more bruschetta, with the dead tomatoes and basil. But, delicious squash curries and pumpkin pies are on the horizon!